Eye care in your pet is as important as a balanced diet and enough daily exercise. Checking your pet regularly to detect any abnormalities early is a prudent act that you should not forget. 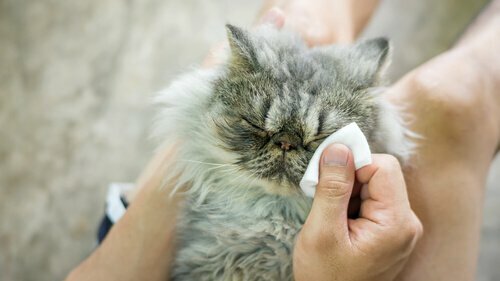 One of the most common conditions are eye secretions and, although it is more common in dogs, some cats may suffer from it. This could be a sign of anything from an infection to glaucoma or allergies. If your pet has an ocular discharge Clear, it is likely to be caused by allergies or something physical, such as dust in the eye. A watery discharge or mucus is often a foreign body sign , like an eyelash, while if it is greenish yellow or like pus it could indicate a serious infection. to find out the main cause. Some of these problems can result in blindness or loss of an eye, if not treated in time. This is a type of inflammation of the lining of the eye. that can generate a yellow pus that bothers the vision. It is often accompanied by eye redness and sensitivity to light, so your pet will want to remain with his eyes half-closed. The most common causes are absence of eye care, allergies and dry eye due to obstruction of the tear duct. If your pet has watery eyes, and the skin of the eyelids is stained or smelly, it can be a corneal ulcer . Excessive tearing can also result from abnormal eyelashes, tear duct obstruction, or tumors. A failure to produce enough tears for cleaning and eye care It can be evidenced by the presence of sticky secretions. It can also include mucus and inflammation of the eyeball. This condition can be the result of an injury near the gland that causes tears or failures in the immune system. This condition is caused by excessive pressure on the the eye and can be detected in several ways: one eye or both bulging, cloudy eyes and sometimes excessive tearing. Glaucoma causes a lot of pain, so the veterinarian can try to control eye pressure with medication, but surgery can be recommended. In First, familiarize yourself with the shape and eye features of your pet . Frequently check out his eyes: the pupils should be the same size and bright, with white around the iris. There should not be any breakage and the internal eyelids should not be visible. The inner part of the lower eyelids should be pink, not red or white. If you see tears, secretions, hair stained with tears, cloudiness, eyes closed or half-closed, or pupils of unequal size, something might be wrong. It's time to go to the vet. To keep the dogs' eyes bright and healthy, you should keep the coat out of their eyes . Take your dog to a canine hairdresser or use round tip scissors to trim it yourself.However, the animals of the city do not escape from these affections and also special care must be taken and make the respective visual verification periodically. For The eye care of your pet is important to perform a routine maintenance , preferably with a piece of soft cotton cloth. Clean gently around the eyes and in the corners, while making sure you do not touch the eyeball. A couple of times a week is a good routine for most pets. You can use a sterile eye rinse or commercially available eye wipes to keep the skin around your pet's eyes clean. . Ophthalmic ointments are also available to protect the eyes before bathing your pet . Keep in mind that even neutral shampoos can cause irritation if it falls on your eyes or if you do not rinse quickly enough. Eye care on your pet is very important. Be sure to provide the necessary care and control any problems , and contact your veterinarian if you have any questions regarding the eye health of your pet.